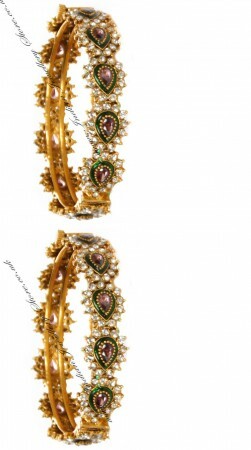 PAIR of stunning Indian bangles in 22k gold with black antique plate & bottle green meena (enamel) & aubergine purple stones. Set with polki & diamamnte stones. Size: 2.4, i.e 2 & 4/16 inches inner diameter (small). Bangle thickness (aprox max): 1.6cm. Indian Jewellery Store LOVES this product paired with our set of 4 green american diamond bangles.